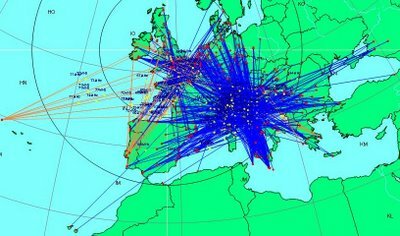 Well yesterday the 144 MHz Band opened up via the Sporadic-E propagation mode. Alas whilst it was a good opening it did not provide any dx at this location. As can be seen from the map below most of the enhancements favoured southern european countries like Spain, Malta and some excellent double hop into Russia. The one drawback with this kind of opening is it is very restricted as to where the signals get refracted to. Some of the Big Gun stations in the UK managed to work some of the DX but it just did not bend the signals into my antenna. Ah well maybe next time.